The boat-hulled (quite literally) Ramphos Trident is the newest SLSA plus a low-cost amphibian. At top right is a schematic of the in-position wing-fold mechanism. At lower right, Ramphos is displayed at the Zuhai airshow in China some 700,000 persons attended! At bottom left, Australian Ramphos pilot Gavin Penfold does a little fishing from his craft. A few years back I evaluated Ramphos. Now, the boat-hulled trike is our newest Special Light-Sport Aircraft amphibian -- SLSA #102. Priced at less than $40,000 for the Rotax 582-powered version to something north of $50,000 for the four stroke Rotax 912 powerplant, this seaplane qualifies as a bargain. Ramphos Trident won its SLSA approval back in April 2009. *** In revealing this achievement, one of the most interesting points from U.S. partner Gil McGarity concerned a Ramphos entry to the potentially huge China market. "Just when things looked the darkest, what with spending all our money for the certifications and the recession starting with a vengeance, we were invited to China," Gil recalled. "We struck a deal to help develop a line of weight-shift aircraft and train personnel to fly. We were given 10 young engineers trained in using the Katia CAD programs, two 747-sized hangars with state of the art paint rooms, composite labs, 5 and 7 axis CNC [machines], assembly areas and a seemingly endless stream of development funds." To show how serious officials are about opening the gates to sport aircraft, Gil said authorities... "built a 500-meter asphalt runway for LSA craft very near us in Changsha." He noted that very few if any recreational aviation runways exist in China. In addition to the trike project, Gil added, "We are working on several LSA projects including a very hot all carbon [and] kevlar low-wing three-axis two-place [design]." I'll be keeping an eye on this team. A few years back I evaluated Ramphos. Now, the boat-hulled trike is our newest Special Light-Sport Aircraft amphibian — SLSA #102. Priced at less than $40,000 for the Rotax 582-powered version to something north of $50,000 for the four stroke Rotax 912 powerplant, this seaplane qualifies as a bargain. 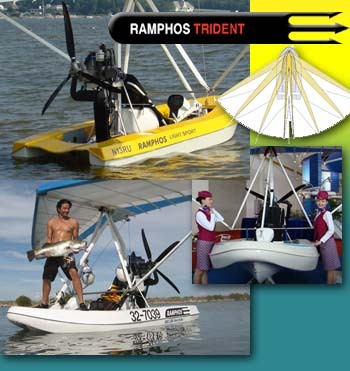 Ramphos Trident won its SLSA approval back in April 2009. *** In revealing this achievement, one of the most interesting points from U.S. partner Gil McGarity concerned a Ramphos entry to the potentially huge China market. “Just when things looked the darkest, what with spending all our money for the certifications and the recession starting with a vengeance, we were invited to China,” Gil recalled. “We struck a deal to help develop a line of weight-shift aircraft and train personnel to fly. We were given 10 young engineers trained in using the Katia CAD programs, two 747-sized hangars with state of the art paint rooms, composite labs, 5 and 7 axis CNC [machines], assembly areas and a seemingly endless stream of development funds.” To show how serious officials are about opening the gates to sport aircraft, Gil said authorities… “built a 500-meter asphalt runway for LSA craft very near us in Changsha.” He noted that very few if any recreational aviation runways exist in China.